The common perception in the world of the security system is that hire the hacker who has broken the security because he know the flaws of your system and can do better job than your team of software engineers, and yes it is true. It’s easy to break in but creating security which is unbreakable is a tough job to do even for experienced person. Hiring hackers to create system which can be safe from hackers is not an easier task. Hiring hacker is like adopting snake, chances are that it will bite you. One should hire a hacker or not, is one of the hot debated topic and often meetings for systems securities faces these kinds of debates where they consider the pros and cons of hiring former hackers. Most of the meeting ends with two angry participants who were arguing pros and cons but there is no doubt that hiring a former hacker is a risky game which can cost you at a grand level as well as they have their own benefits. 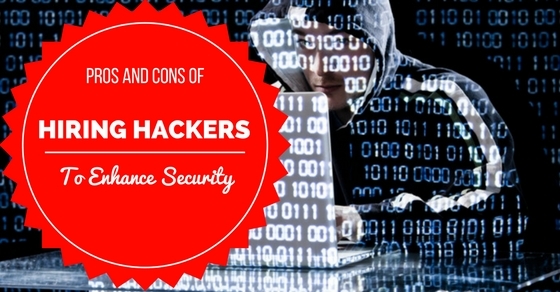 In this article, we are going to discuss pros and cons of hiring hackers. Hiring former hacker is good or bad, it is an ongoing debate for a while and it will be there till we are using systems and the internet, that means it is a never ending debate but by weighing pros and cons you can decide whether you are going to hire a former hacker for your security consultant or not. There is no doubt the person who is breaking in the system can tell more clearly about the problem than your system security employees because they work to keep it running and make sure to resolve day to day issues, But Hackers can break into your system and tell you about loopholes in your company’s security system. The main benefits of using former hacker are. The main thing they have to qualify for the job is experience. Hackers have experience of breaking in the security system which needs different techniques and method to do so. Different systems need different techniques to break in and hackers have experienced so that they have knowledge how to break in a system that’s why they will be best candidates to tell you what the problems are in your security system. Hackers work to break the security and know the loopholes in your system way better than the team you have in your office simply because they have done the task of breaking. Their experience is what you need for your company to enhance your system security and if they are changed now and have working experience with organizations, there is no problem in hiring a hacker. Your dedicated team of software engineers can do so much. They already have so many tasks and a network to manage. They can check manually and can do system analysis to understand the problem in the system and fix it but they cannot find out loopholes in your system by simply checking it. A former hacker who is reformed now can do that for you. They will only focus on finding loopholes in your system and send you to report about the problems. Your engineers can fix it because your security team can manage the network and solve day to day issue but unable to work like hackers. When you hire a hacker they only focus on the system security and finding vulnerable points which can be on the target of criminals to break in your system, they work to find faults not to improve them. That way you have individual attention just on your security system and you can protect it better. Another benefit of hiring former hacker is that you can consult them to make improvement in your system. Improvements are what a system needs to fight with the current threat; your old security system may need some improvements to make it strong. Hackers know where to find weak points and what the sensitive areas to attack are. When you consult a hacker to the analysis they do the hacking in your system with your permission and find out that area of problem and tell you about the problems, that way you have a better chance of getting rid of the problem. Another pro of having a hacker on your security team is that you have latest exploits for your systems. Having former reformed hacker can help you in having the latest security system or upgrading your existing one. The hacker knows the techniques to hack into your system and tell you the vulnerable points and loopholes so that your software engineers can do the necessary changes and you will have latest system security exploits. Most hackers keep an update of latest techniques to break in system security but your security team mostly has limited knowledge and updates due to their busy schedule. When hiring a former hacker who is reformed, make sure your security system is advanced and strong and it is also important to stay alerted. Do all the necessary background check and consult more than one hacker, only then take decisions. Check consultant firm’s background and their former client as well as do not open your all cards to the hackers, after all, what are they doing for you is still the hacking which is legal now and you are paying for it. They are useful because they have knowledge and experience but beware because their knowledge and experience is their greatest tool. Hiring a former hacker to check your security system is like inviting a criminal to your house and then leave the house alone for him to rob. You cannot trust someone who has a criminal background simply because they are criminal for a reason. Hiring hackers is the latest trend in the market and people hiring them on high pay packages to make their security systems better and protected but do they really protect your system or cause you more trouble. There are cons of hiring hackers in your company. One of the main problems of hiring former hacker is their criminal background. Associating with a criminal can put a damp on your image in the marketplace as well as can cause problems if you are dealing with government agencies. There are the chances that they are not reformed or what it takes for a former criminal do some major damage when you have served your company security system on a silver platter? You are going to pay to a certified criminal to break in your security system as it is the greatest disadvantage of hiring former hackers. There are the chances that hackers are not reformed after the visit and staying in jail. Your clients may be unsatisfied with your choice of hiring former hackers. They may not like that their system is checked by the former hacker and now he has the built up design of the system, it can make them uncomfortable and put doubts in their mind about your company. Dealing with former hacker may cause your clients to leave you or termination of the contract before the time limit and both the cases will damage your reputation as well as other business ventures. This is the main problem you have to get ready for because your clients are more important. This is another problem, how can you trust former hackers? How can you be 100% sure that they will not do something illegal with your system or break in your administrative to have passwords and other necessary detail and then use it against you? Having former hacker who are now reformed and out of jail seems risky and you cannot trust former criminal to just change and start working like an honest man. Can you make sure that they are changed now? If he can do it once then he can do it again. Lack of trust is a major issue in hiring hackers because you cannot just trust a thief to be your bodyguard. When the former hacker goes out of jail and said they are now changed and ready to have a stable job and will work to improve security system instead of hacking it, it look too good to be true. There are no legal policies to hire a reformed former hacker. If you hire them to work for you then they will have all the benefits and authorities like any regular employee, as they are your security consultant who have access to your system security. They can easily do what they are doing before and now you cannot even complain to the legal authorities. Yes without losing anything a hacker can have direct access to your security system and salary from you on the side. Hiring a reformed former hacker may look a good idea but when you do that you put your whole security system on the stack. Now they have no problem in accessing your security system even you will never know the changes they can make while working with you and you will be dependent on them to fix it. They can say your system has major security loopholes only they can fix or if you need upgrades only they can do. What will you do other than take their help? It may be in trend to hire former hacker in your system security team to keep your system safe from illegal hackers but hiring a person with a criminal background to make your security system advance seems bit risky and has many flaws than benefits. You cannot just trust someone with confidential information who has a criminal background. There are possibilities that the person you hired may bleed you dry of your money and use your system security for own use. Hence, there are more cons than pros of hiring a former hacker who are reformed now. Hiring a hacker to improve your system security is good or bad? This is the debate which is never going to end not anytime soon. There are benefits of hiring a former hacker and problems as well. After discussing pros and cons of hiring a hacker we can only say that it never going to be 100% secure to hire a hacker no matter how reformed they are. Precautions are the only solution companies have when they want to hire a hacker to improve company security system. Make sure to never trust only one person for consultation and have as much opinion as possible for you. Do all necessary background checks and take a look at the previous work they had done, also never had any confidential information to the person you are hiring with a criminal background. It is true that every person deserves second chance and if they are good in what they do then we should definitely make them comfortable by providing them work but it doesn’t mean hand your whole system in their hand. They are criminals first and no matter how much they deserve second chance don’t trust them completely. Take precautionary steps and draw service contract where to mention each term and condition clearly with security clause. Ask your partners and other business organizations about their experiences of hiring former hackers. Take time before trusting someone with your organization, it is better to be safe than sorry. No doubt some of the former hackers are now the world best-known security consultant and many have a stable job with high pay packages but there are frauds as well who just use their criminal background to get the job as a security consultant and then bleed you dry without your information.